Having recorded all the houses I lived in a few years ago, it is about time that I do the same for my wife and complete the number of posts on this subject. 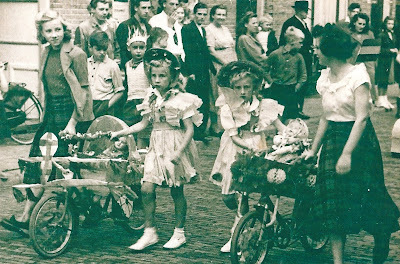 Although she likes to see herself as a Loosduinen native, the truth is that she, like me, was born in The Hague. 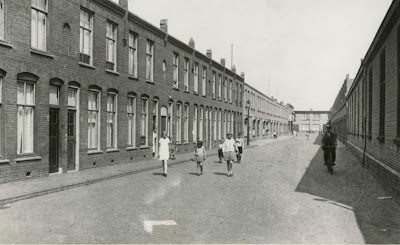 It is likely that her place of birth was caused by the fact that the Netherlands was suffering under German occupation. During WW2 about 8000 houses in The Hague have been demolished to allow for the construction of the Atlantikwall, the German line of defense against an invasion of British and allied troops. So when people married, there was no guarantee that there was a house available for the newly weds. That was also the case when my parents in law got married in 1942. My wife's father was the eldest son of a family with 14 (!) children, the last one being born in that very same year 1942. It will be no surprise that there was no space left in that house to accommodate another family in the making. Although the parents of my mother-in-law did not live in spacious circumstances either, there apparently was some space left there for the happy couple to live in. It was smack in the middle of the working-class district called Transvaal. My parents-in-law got married on Oct. 28, 1942 and ten months later, on Aug. 29, 1943 their daughter Adriana came to life. They lived in the 4th portico on the 2nd floor, number 81. Eight months after this event the now family of three moved to nearby 11 Kritzingerstraat where they had a home all to themselves. It was May 4, 1944. 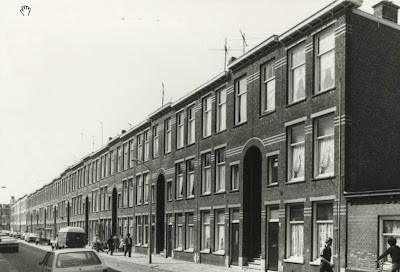 The house was on the 1st floor near the lamppost on the right hand side of the street. 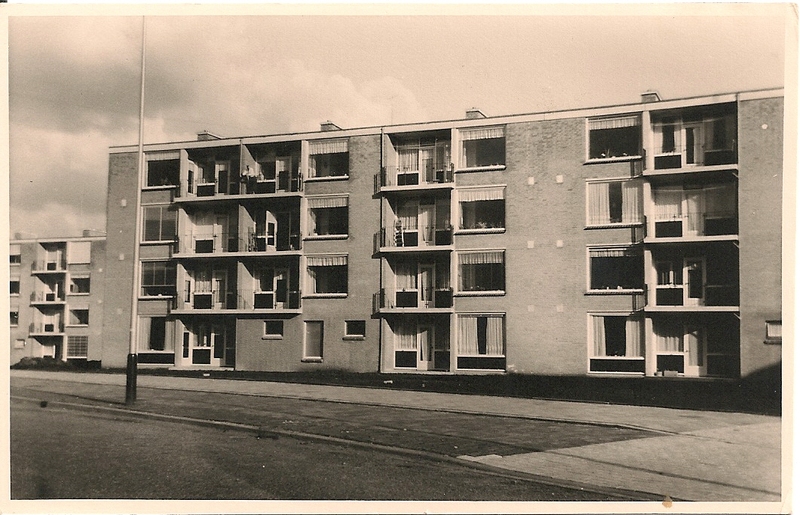 At the time my father-in-law was a laborer in the rubber factory Vredestein in Loosduinen. Their main product was tyres. He also worked as a stoker in the horticulture where mainly tomatoes were grown. Although the distance to his work was not very significant, a couple of miles, having a house in Loosduinen was preferable. But they had to wait until a couple of months after the war to get a house there. 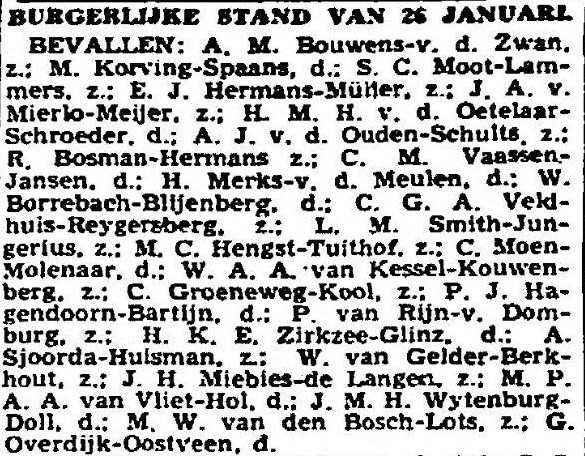 On Sept. 29, 1945 they moved to 37 Evertsenstraat*. The house is beyond the lamppost on the left. Here my wife spent her youth with her grandparents and most of their 14 children living very nearby on number 33. 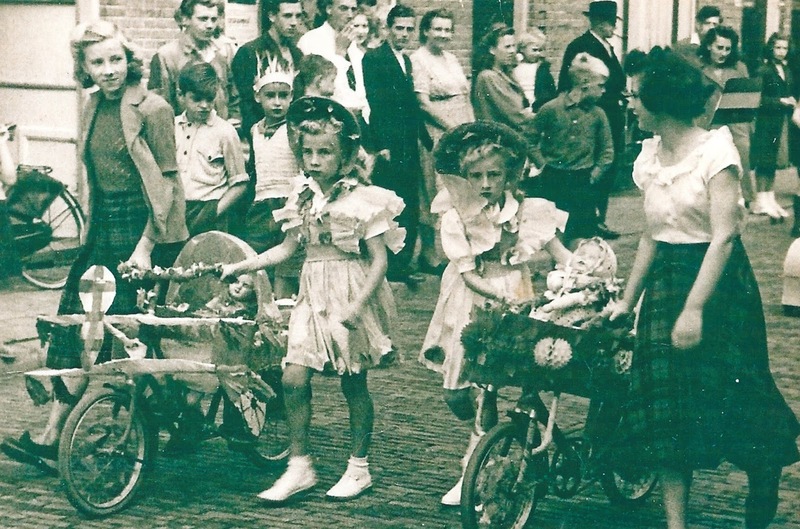 During the post-war years often there were festivities in the Evertsenstraat and the streets adjacent thereto. The above picture shows "front runners" (f.l.t.r.) Riet Orie, Sonja Orie (both aunts of my wife), Adriana Orie en Corrie Duijvestein, a girl living next door. 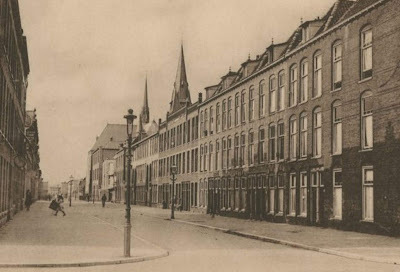 The last house Adriana, better known today as Jeanne, lived in before she married, was also situated in Loosduinen, in the street formerly known as Kijkduinsestraat. Today this is the Pisuissestraat named after a well known singer and comedian who was murdered in Amsterdam in 1927. 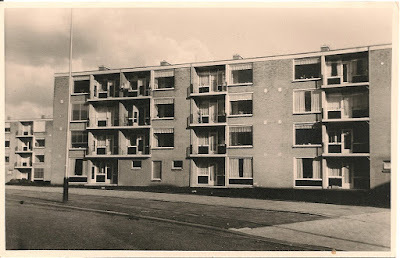 Around July/August 1963 the family moved into a newly built apartment building. Number 88 was theirs. It is on the first floor to the very right. From her bedroom Jeanne could see where her fiancé lived in the next block. And from there on (1965) they happily lived together. If you want to comment, please go to the end of the post. Click on 'No comments' or '# comments' and the comments form will be displayed. Sometimes comments are shown already. In that case the form is just after the last comment made. How far did my ancestors move?